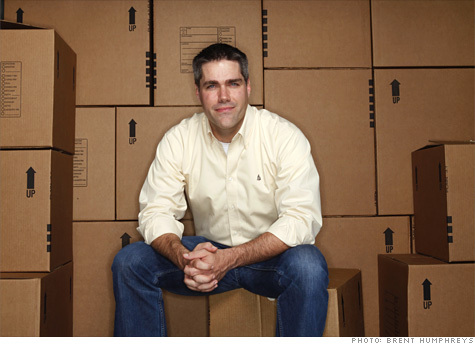 (CNNMoney.com) -- In 2001, Matt Chasen's mother wanted to send an antique dresser from Ohio to Texas, but was staggered when she received a $1,000 shipping quote -- far more than the dresser was worth. Unable to find a cheaper option, she never sent it. One year later, Chasen reserved a nine-foot truck to move from Seattle to Austin. When he arrived at the rental center, the only one left was a 20-footer, so he took it. Standing in the back of the cavernous vehicle, he thought of his mother. "I thought, 'Wow I wish I could have gotten in touch with people with half-empty trucks to move my mom's dresser,'" he recalls. The idea: Inspiration hit Chasen, 34, like a Mack truck. Why not create a sort of eBay (EBAY, Fortune 500) for shipping, a Web site that would make the process cheaper and more efficient by taking advantage of all the empty trucks on the road? Chasen's wife told him it was the dumbest idea in the world. Undeterred, he brought the concept to McCombs Business School at The University of Texas, where two of his classmates -- Jay Manickam and Mickey Millsap -- later joined him as co-founders of uShip. In 2004, they launched the site, which solicits shipping requests from the public and lets freight companies with extra space bid for jobs. UShip earns a 10% transaction fee for each delivery. That spark of an idea has gone on to save thousands of dollars for people like Jerry Eldred. The 52-year-old stumbled upon uShip during an online search after he received $7,000 quotes from big moving companies to move his two cars and his household possessions from Fremont, N.H., to Austin, where he got a new job. Eldred found uShip and then found a New Hampshire driver with an empty truck who moved everything for $3,800. "You have to do the homework yourself but it makes it much easier to find a deal," says Eldred. The risk: Not everyone wants to help people like Eldred or Chasen's mother. Many drivers simply aren't interested in the hassle of picking up and moving a bunch of random stuff, whether it's a broken-down bulldozer or grandma's piano, suggests Tim Barton, CEO of Freightquote.com, an 800-employee Kansas City company that also offers competitive bidding and brings in $400 million in annual revenues. And uShip faces another quandary: in a weak economy, Chasen can expect plenty of excess truck capacity, but fewer people who want to ship, while good times will bring the reverse, explains Kevin Sterling, a transportation analyst at BB&T Capital Markets. "They've got to manage that," he says. The reward: While bigger players like Freightquote.com and CH Robinson Worldwide may be ideal for the shipping needs of large companies like Wal-Mart (WMT, Fortune 500), uShip may be a good fit for small businesses and individuals who are unfamiliar with the trucking industry, suggests Sterling. "The need is there," he says. "Small businesses may not have access to a large truck broker, and uShip is probably a cheaper alternative." Although Chasen initially thought uShip would be used to mainly ship household items like his mother's dresser, the listed items have ranged from a warehouse full of a million baseball cards to military tanks, boats and airplanes. The 50-employee uShip has grabbed investment dollars from Benchmark Capital -- the venture firm that took a $5 million gamble on eBay back in 1997 -- and estimates that it doubled its annual revenues in 2009, to approximately $6 million. Since uShip launched six years ago, shippers have paid more than $125 million for services brokered by the company. Nearly 900,000 listings have been posted to the Web site, attracting bids from tens of thousands of transport companies.